3-Margaret Elizabeth Harvey was born on 30 Jan 1886 in Black Hills, Osmaston, Tasmania and died on 2 Oct 1942 in Forth, Tasmania at age 56. Margaret married George Mortimer Barker, son of George Barker and Mary Yaxley Vertigan, in 1934. George was born on 11 Jan 1873 in Forth, Tasmania and died on 30 Oct 1963 in Forth, Tasmania at age 90. Margaret (Maggie) trained as a nurse at a small private hospital at Sheffield run by a Dr. Rattan. Sarah Jane (Jean) went to train at a private hospital in Victoria but having never been robust she had an attack of kidney failure and was unable to complete her training. 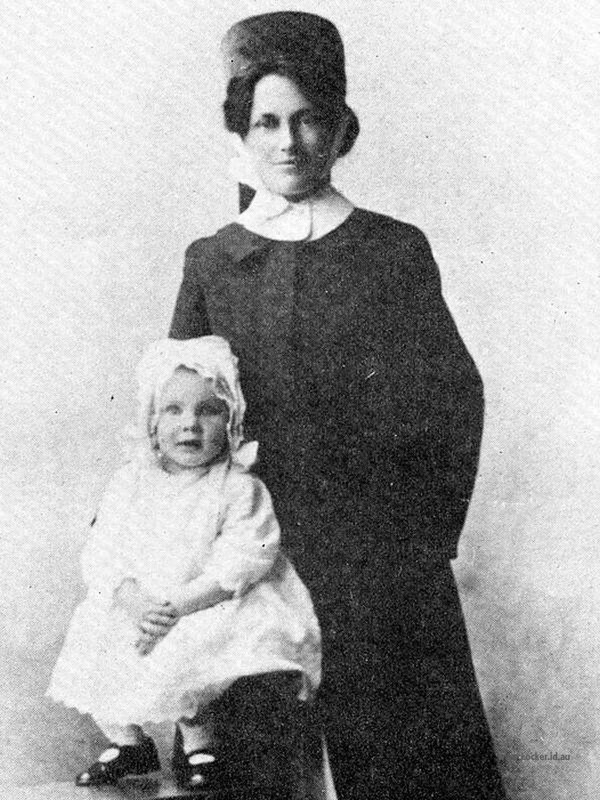 Nevertheless she was a very capable nurse, always known as "Nurse Jean" when later she assisted at the private Deloraine hospital run by her sisters Maggie and Rosa. She lived to the age of sixty, dying in October 1944 at the Devonport home of her sister Edith where she had lived for some years. In 1924 Margaret and her sister Rosa opened a private hospital in Barrack Street, Deloraine. This was mainly, though not exclusively, a maternity hospital. When Rosa and Charles came back to Deloraine, Maggie moved to Westbury where she ran a maternity hospital in Dexter Street, until her marriage in 1934 at the age of 48, to widower Mort Barker, a farmer at Forth, where Maggie lived until her death in 1942. The funeral of Margaret Elizabeth, wife of G. Mortimer Barker, of Forth, took place at the Forth cemetery on Sunday. The service at the graveside was conducted by Rev Hull, of Ulverstone. Mrs. Barker was the eldest daughter of the late Mr and Mrs J Harvey, Deloraine, where, for many years she practised as a nurse. She also nursed at Sheffield and Westbury and was beloved for her bright personality and capabilities. For the last nine years she has lived at "Woodlyn," Forth. She is survived by her husband and family, Mrs. R. Carey, Victor and George (both in the A.I.F.). The chief mourners were her husband and two brothers and Mr. R. Carey. Pall-bearers were Messrs. C. and A. Parker, G. Carey and R. Yaxley. Carriers were Messrs. F. and E. Harvey, R. Carey and K Vertigan. There were many floral tributes, including one from the Forth Methodist Sunday School.